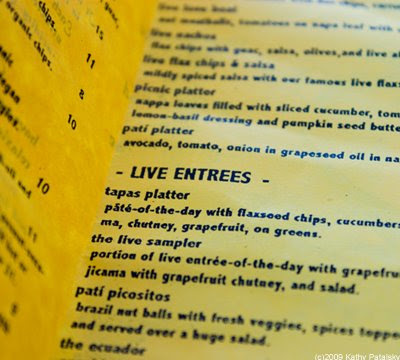 Food Menus for Special Diets: Five Hot Features. Symbols. First, when I see a restaurant taking the time to put a special symbol on their menu representing items that are low-fat, low-calorie, vegan, dairy-free or vegetarian. A perfect example of this is the little carrot that Le Pain Quotidian puts next to all its vegan menu items. 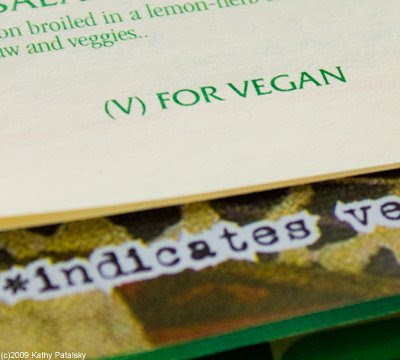 Listen up menu designers: A simple (v) on the menu is a great way to indicate whether or not items are vegetarian or vegan-just be sure to specify what the symbols stand for! Sections. This is when a menu designates a bit of its precious space, aka menu real estate, to a special diets section. This section may show low-cal items, vegetarian options, live/raw items, low sodium options or even gluten free items. Hosting a special section-no matter what cuisine you are serving allows customers to see right away that you are thinking of everyone. It's the same idea as when family restaurants have "kids menu" sections. The customers can know: "Oh, awesome-I can bring my vegetarian friend here because I see a vegetarian section!" Without special sections, diners are forced to modify and double check just about everything they order. More time for the waiters. I hate when I am forced to order the Chicken Salad with "no chicken!" An example of a restaurant with a great special section is Caravan of Dreams. For the raw diet diners, they put all their live/raw menu items in separate sections from the cooked items. Another special section can be found at Craft NYC. Though I am still harping on Craft to get a vegan entree or pasta on their menu, they have effectively arranged all the veggie, mushroom and grain dishes in separate sections-so you can easily create a fabulous tasting menu of veggies, mushrooms and potatoes-like I did on my last visit. Verifications. The next menu feature that really charges a grin on my face is the restaurant that goes out of its way to inform customers of its dietary standards, nutritional features or cuisine policies. What a fabulous feature when a restaurant prints right on the menu, in full sentences, the features and assurances about certain menu items. Examples: *does not contain dairy or *contains 19 grams of vegan protein. On Jamba Juice's online menu you can group they menu items by special diet and in the menu item description it will tell you facts about that item. The Protein Berry smoothie says: packed with 20 grams of protein. And since it's in the vegan menu items section online-you are assured that it is vegan. Real Food Daily in Los Angeles, states on its menu: "Our orange juice is freshly squeezed every 24 hours." I love that. Full disclosure makes for a happy customer. Glossary. I love when I open a menu and I see a nice big glossary along the edges or back of the menu. Sure it may not look as clean and sleek, but diners love to learn! And if someone doesn't know what wasabi, tempeh, seitan, agave or spelt flour are-they can quickly find out! Josie's in NYC has an awesome glossary on its menu. Another great glossary is on the Angelika Kitchen menu, also in NYC. Hidden Gems. I love when a menu that is clearly devoted to carnivores and 'everything-but-the-kitchen-sink" eaters, has at least one or two options that are clearly special diet friendly. It lets me know that this restaurant is thinking outside the mainstream. My favorite example is at Cafeteria in Chelsea nyc, a restaurant with fried chicken, mac n cheese, burgers and fries all over its menu. But it also has the silent gem: the Vegan veggie burger. Not only is it 100% vegan (as stated directly on the menu) but it is fabulous. And you can even sub out your greasy fries for a mixed greens salad. Another hidden gem is at Crif Dogs nyc. Not your typical hot dog joint-since they serve what many say is the best veggie dog in the city. And lastly, even Starbucks-is has a few hidden gems. They now serve a gluten free pastry. And were one of the first big coffee shops to embrace dairy free beverages. However, I'm still waiting on the the blended soy frappachino or chai I crave. A note about this list below: I tried to not only include typical healthy menus, but also menus that have features for a variety of special diets. This is just a very small sample of some notable menus. My Special Diet Friendly Menu Awards. Best All-Around Menu: Babycakes NYC. Why: Yes, Babycakes builds its branding around catering to special diets, thus is why they get the all around best award. Babycakes is in my opinion the most special diet aware joint in the city. Not only does their menu discuss the issue of food allergies and special diets, but their staff does as well. If you order an item containing spelt, the cashier will actually confirm with you to make sure that you don't have spelt allergies. If you order a frosted cupcake item, the cashier will remind you that the frosting should be kept refrigerated. Written menu and spoken word assurances. Rare, but amazing. Why: I chose Josie's because it is a restaurant that is not vegan-but vegan friendly. They serve meat and fish. Josie's is a place that you can take just about anyone for a delicious healthy meal. They are branded as organic and dairy-free. Family-friendly. They have a vegetarian friendly section on the menu. They also have a glossary. And if you ask the staff, they will easily tell you what is what on the menu. 1. Counter. Newly designed menu has a "vegan" section on the brunch menu. Also indicates "raw" items on the dinner menu. Easy to read. 2. GoBo. Glossary and informed staff. 3. Spring Street Natural. Has a (v) indicating vegan menu items-which there are a lot of. 4. Le Pain Quotidian. Has a carrot symbol indicating vegan menu items. 5. Craft NYC. Has menu grouped by type of foods. Sections. 6. Teany. Has a (v) for vegan options. 7. Jamba Juice. Online menu allows you to sort menu items by "special diets"
8. Angelika Kitchen. Awesome glossary. Awesome. 9. The Pump Energy Food. Sections galore. Even has a guilt-free section with low-sodium ingredient options. 10. California Pizza Kitchen. Though the menu isn't very special diet friendy, the website is. They have an allergen info pdf and a vegan friendly pdf. Maybe with some nagging their menu will be more vegan friendly-I mean they are called California Pizza Kitchen. 11. Cheesecake Factory. 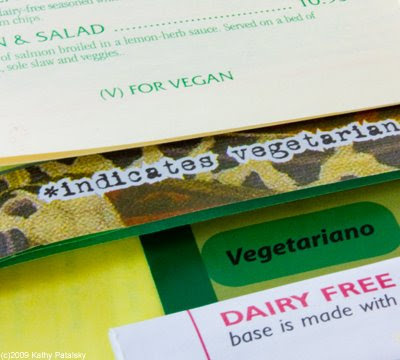 Not a vegan friendly menu design. But for the 'weight management' special diets, they have a whole section. I really wish CF would make a vegan menu items section-since they only have a vegetarian items list on their FAQ'S web page. Long way to go, but at least they have begun to improve options. 12. Whole Foods Market Fresh Foods. Has a nice vegan symbol on all vegan prepared food items. Ingredients plainly listed. 13. Mexican Mentions. I have to give a few Mex restaurants shout-outs. Mexican restaurants are usually pretty easy to predict when it comes to menu items. Rice, beans, tortillas, guac, salsa, ect. But I have to applaud California Tortilla and Chipotle for making both the allergens info and nutritional info easy to access. Their online sites have a lot of menu info. Yay. And San Loco has a star next to all vegetarian menu items. Baja Fresh has nutritional info online, but them actual menu has no indicators. And Qdoba is awesome in terms of full disclosure. All allergen and nutritional info is made available. 14. Native Foods. 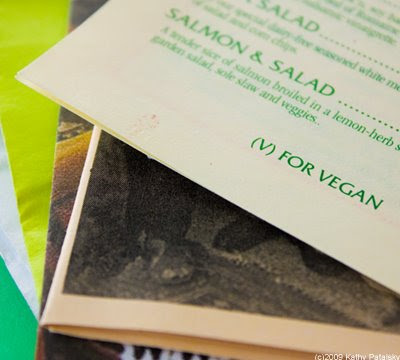 One of my fave California Vegan themed restaurants takes the time (and space, on its menu to remind customers that everything is dairy-free-even the mayo! 15. Trader Joe's. Not a menu, but awesome online special diet pdf's for their grocery items. On-product indicators with symbols are also top-notch. *This was a short list with a few good examples. 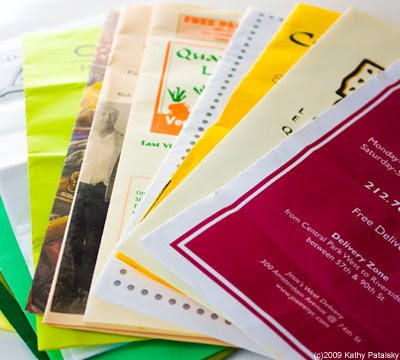 If you have any favorite menus-let me know!